It is 74 years since the callsign 2LO was in use by the BBC, but even now it is still recognised by many members of the general public and not just vintage wireless enthusiasts. Usually people associate it with early wireless receivers and the BBC’s first programmes, but the key technology that created the magic of these radiowaves was the transmitter. Actually, three transmitters were assigned the callsign 2LO. 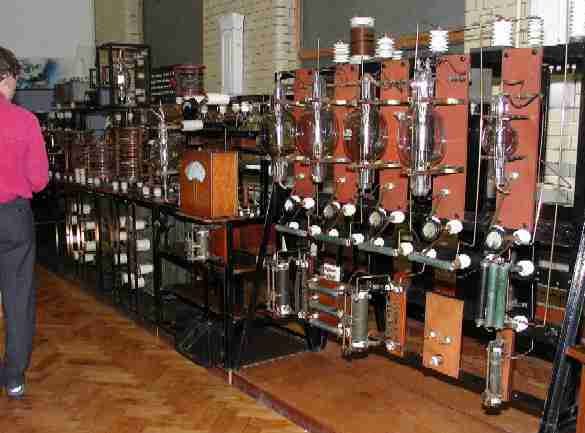 The first one only produced 100W and it started transmitting from Marconi House in the Strand, London on 11 May 1922. Its design was fairly similar to the 250W transmitter at the famous hut in Writtle with the callsign 2MT. He pioneered the use of valves for high power wireless telegraphy and telephony transmission. He was awarded the Military Cross as a result of developing and overseeing the radio direction finding system that detected the German High Seas fleet breaking out into the North Sea. This led to the biggest battle in the history of naval warfare. The outcome of the Battle of Jutland was indecisive, with both sides claiming victory, but the course of world events might have been very different if the German fleet had proceeded undetected and unopposed. He played a leading role in Marconi’s early test broadcasts and he even persuaded Dame Nellie Melba to prolong her famous recital on 15 June 1920, after her broadcast was interrupted by a valve failure on the high power transmitter in Chelmsford (callsign MZX). He continued with pioneering work on gramophone recording systems, cinema sound systems, echo sounders in WWII and many other things. He averaged about one patent every 6 months until registering his last one at the age of 83! So, the 2LO transmitter was the product of a great engineer working for a great company and it was the key technology which enabled that great organisation the BBC to start broadcasting. It is fitting therefore that the transmitter is now being preserved by the Science Museum in London, after being donated by the joint owners: Crown Castle UK and the BBC. The Science Museum held a celebration to mark this event on 14 November 2002, the BBC’s 80th birthday. 2LO at the Science Museum. The transmitter was in service for the BBC from November 1922 until April 1925, at which point a replacement transmitter of nearly twice the power but still with the callsign 2LO took over at the Selfridges building in London’s Oxford Street. This transmitter closed down in October 1929 when the new high power MF station opened at Brookmans Park about 15 miles north of London. Some 25 years later while a senior BBC manager was visiting Brookmans Park he noticed a pile of old transmitter parts in a storeroom and when told that they were from 2LO he immediately recognised their importance to the Nation’s broadcasting heritage and ordered the reconstruction of the transmitter. This involved a lot of detective work by the operational engineers based at Brookmans Park who carried out the work and they had to manufacture some of the missing parts or acquire them from elsewhere. It was not feasible to restore the transmitter to full working order due to the high power involved and restrictions caused by safety requirements, but most of the components were mounted in their original positions and connected together. The circuit shown with this article was re-drawn in 1972. Since being re-built in the 1950’s 2LO has appeared in a few exhibitions and further restoration work was done in the 1970’s prior to filming for a television programme, that unfortunately does not appear to have been broadcast. It was nearly consigned to the scrap heap in the 1980’s, but fortunately it remained in storage at Brookmans Park and then Daventry. Unfortunately it is not yet on general display to the public (like most the Science Museum’s objects) but it is being kept safely at the museum’s store in Blythe House near Olympia in London. New: 2LO will be on display in the Science Museum (Exhibition Road) before the end of 2014. 2LO was used for some of Mr Baird’s early television tests, but he used the final transmitter installed in the Selfridges building. This was a double Marconi “Q Type” that was heavily based on the 2LO transmitter discussed above. Further television tests made use of the Brookmans Park transmitters that replaced 2LO, but the BBC’s first purpose designed television transmitter was installed at Alexandra Palace in 1936. Alexandra Palace was unique in its day and although television had been transmitted many times before in various forms, the signals sent out in 1936 from those now familiar aerials were quite new and exciting. The high definition programmes were to herald in a new era in broadcasting. So far as the vision transmitter was concerned it needed to cope with this new technology, and it was the combined efforts of Marconi and EMI that produced a remarkable design. Marconi were responsible for the rf sections and EMI the modulator. A high power transmitter at 45 MHz with a bandwidth of some 3 MHz was edge of technology in the 1930's, and it was to their great credit that the equipment was still in service in 1956. It had a rated peak white output power of 17kW (positive modulation) and the aerial system produced an effective radiated power of 34 kW; this was the maximum erp allowed at the time. The Carrier frequency of 45 MHz was derived from a 22.5 MHz drive unit which fed a doubler in the transmitter. Six rf amplifier stages followed with the final stage being grid modulated. The modulator comprised four stages of amplification and included a system of dc restoration. An interesting feature of this was that it included a dry battery as one of its reference potentials. This was no less than a standard 120v tapped battery of the type used in domestic radio receivers of the period! It did however provide an extremely effective dc clamp. Marconi also provided the 3 kW sound transmitter and the station employed separate sound and vision aerials. A newcomer to the station would immediately recognise the familiar style of a Marconi HF transmitter, complete with the standard control desk of the period, but there of course the similarity ended. However, like the HF stations of the day the vision and sound transmitters employed rotating machines to provide filament, bias and the various HT supplies. At purpose-built stations the machinery was always installed in a dedicated area away from the transmitters, in order to divorce them from the inevitable noise, but Alexandra Palace was somewhat different. The building had not been designed with the idea of housing a transmitting station, and the accommodation consisted mainly of a number of very large rooms, one of which housed the vision transmitter, machinery and all. (The sound transmitter was located in another room.) One sat at the control desk, facing the transmitter at one end of the room, and behind were the lines of motor generators. In addition, the main EHT was produced from a 50kW 500Hz motor alternator which screamed away at the other end of the room, supplying a mercury arc rectifier. The overall noise was pretty high and made such things as monitoring the sound programme or answering the telephone almost impossible. There was an oscilloscope which displayed the sound carrier so at least one could tell if modulation was present! As for answering the telephone an accoustic hood was provided but was of little help. The effective range covered approximately 25% of the UK population, and was much greater than had been expected. In the beginning of course there were very few television receivers, but by 1939 when the service was closed down at the onset of world war II, there were some 23,000 sets in use by the public. During the war both the sound and the vision transmitters were either made ready or used in anger against the Germans. In the early stages, when the threat of invasion was at its greatest, the vision transmitter was made ready to jam XE "jamming" the communication links of German tank formations. On another occasion a similar scheme was prepared to interrupt German Paratrooper frequencies; fortunately neither of these arrangements had to be used. The sound transmitter was however used to confuse the German ‘Y-Gerat XE "Y-Gerat" ’ radio navigational system used by their bombers; a very effective system using a series of radio beams. This counter-measure, known by the code name ‘Domino XE "Domino" ’, was so completely successful that the German system was withdrawn. In 1944, misleading information about the guidance system used in the German V2 rockets XE "rockets" resulted in plans being made to use Alexandra Palace XE "Alexandra Palace" and certain other transmitters to disrupt the system. On the information then available it was believed that the rockets were guided by a radio system capable of being jammed. Before the plans could be put into operation the true details became known and it was clear that jamming XE "jamming" in this way was not feasible, and the idea was abandoned. With the end of the war, it was decided to re-open the television service using the original Alexandra Palace XE "Alexandra Palace" transmitters. The modifications for war-time use were removed and considerable work was necessary to reinstate the equipment. New aerials were erected and the system was ready by early 1946. Following a period of test transmissions for the benefit of dealers, the service was formerly opened by the Postmaster General XE "Postmaster General" on the 7 June 1946. Alexandra Palace continued in service until 1956 when the new station that had been built at the Crystal Palace site was brought into operation. The close down of the final transmission from Alexandra Palace on the evening of 27 March 1956, was quite unusual and certainly unique. The television news studios were located on the floor above, and it was decided to bring down a camera and radiate a picture of the control desk and vision transmitter, with the duty engineer running down the main HT - quite dramatic, but see below. New: Tony Meacock writes: "I was an engineer in Studio B at the time. The duty engineer was asked to switch off the transmitter. He duly turned to a panel and flicked an inconsequential switch. That is all the viewing public saw, as the switch removed the drive and immediately the transmitter went to black. The people in the gallery were somewhat taken aback, as they had hoped to broadcast shots of various people throwing big switches. So yes, it was dramatic, but not quite what was expected by the production team!" A fitting end to a very historic transmitter. Circuit of 2LO in gif format: Crown Castle UK. The function of the part of the circuit surrounding the LS2 valve in the bottom right hand corner is not at all obvious. However, in 2007, Adrian Tuddenham solved the riddle. It's the rectifier for the modulation meter between the cathode of the LS2 valve and the common line of the four grid bias batteries, and (like later BBC PPMs) reads backwards. The 2LO circuit was re-drawn in the 1970's by Rod Viveash and George Morley. Rod, believes that LS2 was regarded as a peak voltmeter circuit and he still has a relic of it. It's a wirewound rehostat marked "P.V. Meter Dim> Bright<" and he believes it to be the LS2 filament resistor which might have been used it to calibrate the meter. Today none of this part of the circuit remains, only a light bulb where the LS2 was. Adrian Tuddenham's web site Poppy Records includes a recording of part of the Remembrance Day programme broadcast from the 1926 version of the 2LO transmitter. The recording may have been made off-air, but this is open to question. If you have any information about this would you please send an email (it will be forwarded to Adrian). The recording was made by P.G.A.H. Voigt on 12 Nov 1926 and was dubbed and issued as a commercial disc a few weeks later. The version on the web site is made from the commercial pressing, not the original, but the modulation quality is amazingly good. More of the programme is available on a CD which can be purchased via Adrian's web site.